Susan Brownell Anthony was a suffragette, meaning she was in favor of women's right to vote. Many women in her time stood up for their right to vote, but Anthony was the mother of the cause, a true pioneer. Her hard work paid off a few years after her death, when in 1920 the Nineteenth Amendment to the U.S. Constitution was ratified. This amendment is also known as the Susan B. Anthony Amendment. Clarina Howard Nichols was one of the ladies who fought side by side with Anthony. Another one was Anna Howard Shaw. 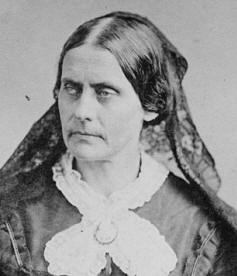 Susan Anthony was arrested, trialed, and fined for illegally voting in the 1872 presidential election. She refused to pay her fine. In 1873, she embarked on a speaking tour and delivered her speech On Women's Right to Vote, also titled Is is a crime for a citizen of the United States to vote? Go here to read Anna Howard Shaw's Eulogy to Susan B. Anthony. Here is more about Elizabeth Cady Stanton. And here is more about Frances D. Gage. In 1900, Susan B. Anthony retired as NAWSA's president. Carrie Chapman Catt became her successor. Here is the link to the Elizabeth Cady Stanton and Susan B. Anthony Papers Project, supported by Rutgers, the State University of New Jersey.